Trials are structured in familar segments – opening statements, direct examination, cross-examination and closing arguments. Of those events, I believe that opening statements deserve more emphasis than any other portion of the case. As trial lawyer Ira Mickenberg has said, “Opening statements are the lens through which jurors view the evidence. 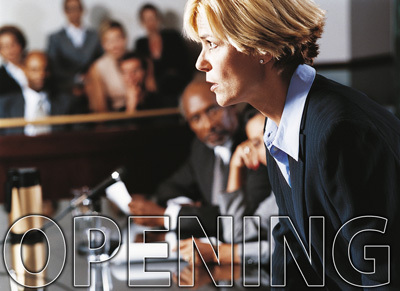 The most important thing to understand about opening statements is that they establish the context in which the jurors will interpret all of the evidence they hear during the trial. [PDF]"
FRAMEWORK: It is a psychological truth that people like to place information in a coherent framework rather than deal with disjointed bits of data. As soon as jurors hear any facts, they will begin to connect the dots and fill in the picture of the events in their minds. Therefore, it is crucial that the framework that they use should be yours rather than the other side’s. WHO HOLDS THE TRUTH? : When the trial starts, jurors figure someone is lying and someone is telling the truth. The opening statement is when they initially reach these conclusions. The opening statement offers the best opportunity to grab and hold the high ground - while at the same time positioning your opposition as slippery. JURORS DECIDE EARLY: Jury research has shown that as many as 80 percent of jurors make up their mind immediately after hearing the opening statements. This may seem unfair or strange, but it is true. ATTENTION: Unless a celebrity witness like Bill Gates or Scarlett Johansson will be taking the stand, the judge’s and jurors’ attention levels will be at their highest during the opening statement. This is your opportunity to grab their attention with a compelling story and compelling demonstrative evidence and keep it. IT'S GOOD TO BE ROOTED FOR: People like to pick someone to root for early. Did you ever watch a sporting event with teams you don't know well? Don’t you normally pick a favorite early in the game? A trial is no different. ABC - ALWAYS BE CLOSING: As is true of all sales events – and a trial is a sales event – emotion is what matters. People buy on emotion and justify on facts. In jury trial terms, that means they decide after opening who is the emotional winner and spend the rest of trial and deliberation justifying their emotional leaning with the facts that fit best. Fahringer has said, in fact, that the opening line of the opening statement is particularly critical because it grabs the jurors’ attention. As Fahringer says, we need to learn from these artists.